When Jessica Vittegleo started an Internet fund-raising campaign to buy and put up Little Free Libraries in Rochester, her goal was simple: to foster literacy and a love of reading in her South Wedge neighborhood. The libraries, which are tied into the national Little Free Library organization, are hand-painted boxes stuffed with books free for the taking. Neighbors are encouraged to return the books or leave one or two replacement books in the library. "There should be a better way for people to exchange their books, and the library just makes it easier," Vittegleo says. Vittegleo says she thought she'd raise enough money to buy a few boxes, but the campaign was so successful she was able to buy 20. Project Scion converted a vacant lot at Dewey and Ravine avenues into a park. The organization also installed a Little Free Library on the site. Most of the libraries have been installed in yards across the city. Half were put up by the Snowball Effect, a community group started by Vittegleo's friend, Ken Braley. She gave all but a few of the remaining boxes to individuals or community groups, including R Community Bikes. 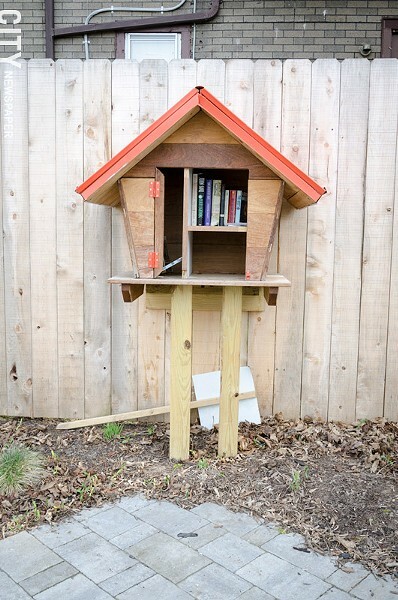 The Little Free Libraries are one of many small-scale, independent projects happening in Rochester's neighborhoods. It fits into an approach that is sometimes called tactical urbanism, which is centered on the idea that small, inexpensive actions can have long-term benefits for neighborhoods and communities. In Rochester, residents and groups have organized to convert vacant or idle lots into edible gardens. They've painted colorful, whimsical designs in intersections — with city permission — to draw attention to children playing nearby or pedestrians. And they've put up signs that direct people to local attractions and tell them how long it'd take to get there by foot or by bike. These projects stand in deliberate contrast to expensive, high-profile development efforts such as the new construction at Midtown or the redevelopment of the Port of Rochester. They're relatively inexpensive, and often require little government involvement. And yet they can have lasting impacts on blocks and neighborhoods. Vittegleo has a library box near her apartment in the Wedge. She says she hears children asking parents if they can take a book. And she says she's watched people have discussions over the books they've taken from the box. The libraries have become a gathering place for neighbors to interact and share, she says. Tactical urbanism sounds more rebellious than it is, though it can be difficult to define. In one sense, it's a philosophical approach to challenges within urban environments. The term was coined by the Street Plans Collaborative in New York City. The firm, which blends urban planning and design with advocacy, has put out three guides to tactical urbanism. They're available at streetplans.org. A Little Free Library on site at the Dewey and Ravine avenues park. "It's how we use very small-scale, inexpensive, often temporary initiatives and projects to seed long-term change," says Mike Lydon, who is with Street Plans. The initiatives may be used to test an idea or to demonstrate the demand for things like public space, bike lanes, and transit, he says. The efforts can be carried out by individuals, informal groups, nonprofits, businesses, developers, or government agencies; intent matters more than who leads, Lydon says. Villages and denser suburban neighborhoods can benefit from some of the approaches, too, he says. The tactics aren't always sanctioned and are sometimes technically illegal, such as when people paint bike lane symbols or crosswalks on streets they think should have them. In New York City, the "20 is Plenty" speed reduction campaign uses replica speed limit signs to encourage drivers to slow down. 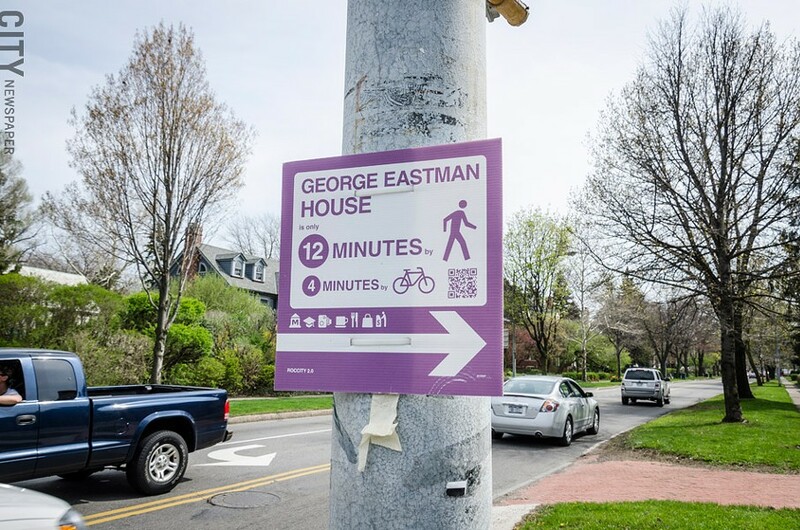 The downtown wayfinding signs put up by Roc City 2.0 are a local example of an unsanctioned approach. Officials and other citizens aren't always happy with these efforts, Lyndon says. But the tactics do raise issues, he says, and often lead to change. But many other tactics are used with government approval or buy-in. Last year, a couple of Rochester neighborhoods received city permission to temporarily close side streets so children had a place to play. On Earth Day, staff from SWBR Architects worked with businesses and other partners to convert a few Gibbs Street parking spots into a small park. SWBR's offices are on Gibbs. RocCity 2.0 made signs directing people to Rochester attractions. The signs are attached to signal poles around the city. Gibbs Street is an energized place, says Mark Maddalina, SWBR's sustainable design director. On a mild spring day, it's typical to see Eastman School of Music students singing on the corner, he says. But the temporary park provided a place for people to congregate. The project was also meant as a catalyst for conversations about the value of small green spaces in downtown neighborhoods. And that includes discussion of whether the neighborhood might be better off with a little less parking and a little more vegetation. "We, as architects, are always designing and redesigning and talking about how things should be," Maddalina says. Vacant and idle lots are a big problem in some Rochester neighborhoods. Yet many of these same neighborhoods lack public green spaces. The owners of two area landscape firms saw a chance to help address the problem. 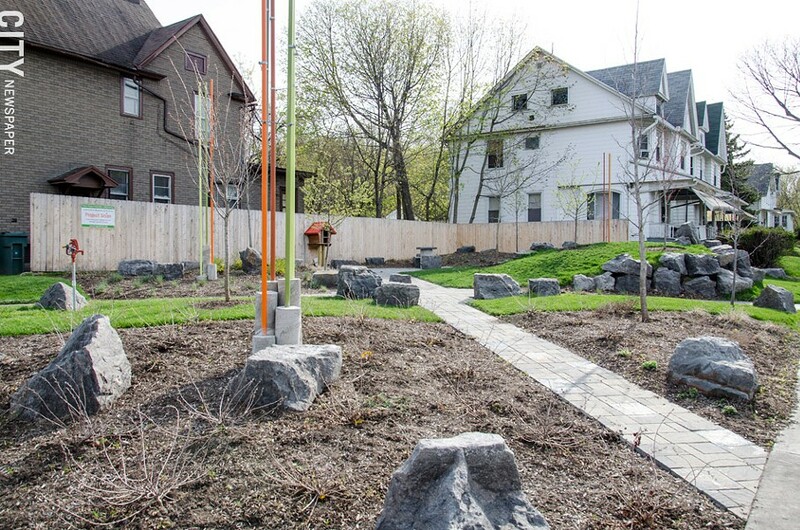 Pietro Furgiuele of Waterford Tilling, along with Bruce Zaretsky and Sharon Coates of Zaretsky and Associates founded Project Scion, which has converted two vacant lots in stressed inner-city neighborhoods into parks. In both cases, the city approved the projects and regional businesses contributed materials. The firms tried to find properties that aren't near other parks or green spaces. And they looked for neighborhoods with active community groups and residents who wanted to get involved. "We don't just build something for the people," Furgiuele says. "We build it with the people." Project Scion made over a lot at Jay and Child streets in the JOSANA neighborhood in 2012. And it took on a lot at Dewey Avenue and Ravine avenues last year. The result: residents and groups are using the parks as community space. They have barbecues and movie nights. And some of the park's neighbors have started gardens on their own properties, Furgiuele says. For 2014, Project Scion plans to work with neighborhood groups who have struggled getting their community gardens off the ground. "You help people and they're going to start helping themselves," Furgiuele says.